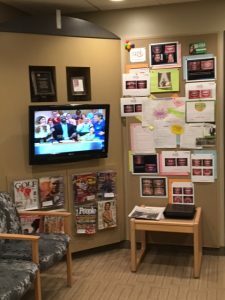 What Makes Our Cleveland Dental Practice Unique? Patients need to have a dentist who’s enthusiastic. One of the things we do is sit down and get to know people. This is just as important as getting to know their teeth! We don’t just put patients in a dental chair, because nothing is more important than discovering individual wants and needs. Ultimately, those looking for a quality cosmetic dentist need to find someone that is passionate about what they do. Dr. Marsh has served on a number of boards. He has also served as company dentist for the Cleveland Opera and as team dentist for both the Cleveland Force and Cleveland Crunch professional indoor soccer teams. Nationally and internationally, he is President-Elect of the Alpha Omega International Dental Fraternity, is a member of the American Academy of Cosmetic Dentistry, and is a fellow of the International Academy for Dental Facial Esthetics. In our reception area – which we don’t call a waiting room because we try not to have people wait – there are a variety of snacks. The selection is fairly healthy, and visitors can also choose between coffee or bottled water. We have plenty of entertainment options, including TV, magazines and newspapers. Sterilization in medical and dental offices is extremely important. At our office, we have a top-of-the-line sterilizer machine so each individual patient is treated with the most sterile tools. Our machine completes the entire process in 6-10 minutes. Our dental hygienists wear sanitary gowns, and wrap surfaces in plastic. This dramatically increases sterilization and makes our patients feel very comfortable with the environment. That is one of our primary goals. Our patients need to be comfortable! Many patients leave reviews on third party websites, such as Angie’s List. We have over 325+ reviews on Smile Reminder and many more on other review websites. These are examples of quality indicators from actual patients. In the past, our office received attention from National Magazine, among others. Having practiced for over forty years, Dr. Marsh has prepared and placed thousands of veneers and crowns. He has worked with and experienced most of the techniques and materials used today. Additionally, Dr. Marsh has been educated by and taught many of the leading cosmetic dentists in the field. It is extremely important to read testimonials, review credentials, and ultimately, select a dentist who is experienced! Our cosmetic dentistry work is often life-changing. Sharon, who was one of our Cleveland cosmetic dental patients, did not smile for many years. She was ashamed of her teeth, and also felt that people didn’t respect her. With this in mind, we came up with a plan that was perfect for her, and would allow her to experience life-altering results. On her lower teeth, we did some reshaping and whitening. We then applied porcelain veneers in stages so she could afford them. Her concerns were important to us, and because we got to know her as a person, we were able to develop a customized approach. Many individuals do not realize how much their life can change with cosmetic dentistry. Of course, it’s extremely important to find an experienced, trustworthy and qualified cosmetic dentist. For over 35 years, Dr. Steve Marsh has been improving smiles in Cleveland and Northeast Ohio. Contact us now to discuss your dream smile and schedule and appointment!